T.R.A.F.F.I.C. conference co-founders Rick Schwartz and Howard Neu sure make it easy to write a headline. When the curtain fell on their latest show March 8th at the Venetian Hotel in Las Vegas, the outcome was the same as it had been for their six previous outings – a new king, T.R.A.F.F.I.C. VII, was crowned as “The Biggest Domain Conference Ever Held.” Attendance figures for T.R.A.F.F.I.C. 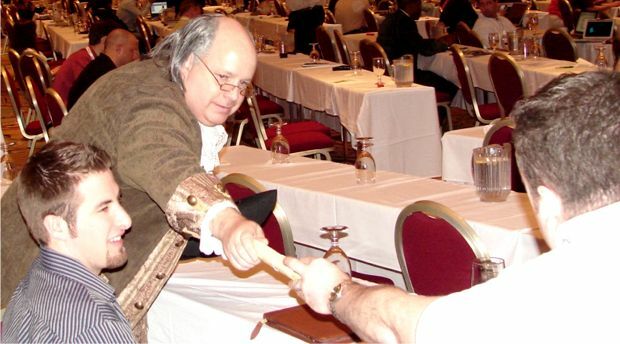 West 2007 swelled to more than 600, topping the previous high water marks set at three Florida shows, two previous events in Las Vegas and another in Silicon Valley. 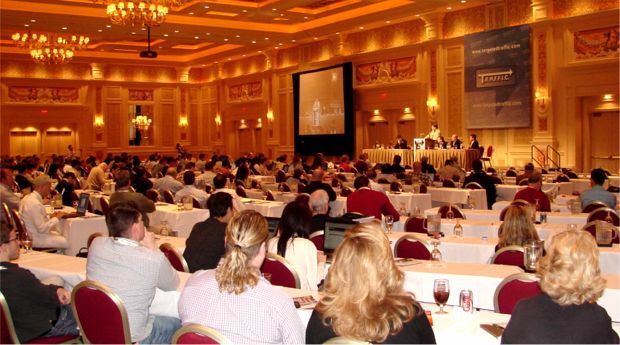 Seeing that huge crowd assembled at the opening session in the Venetian’s ornate new Palazzo Ballroom was a jaw-dropping experience. It is simply amazing how far this industry has come since Schwartz and Neu staged the first major domain conference at a small Marriott in Delray Beach, Florida less than two and half years ago with just over 100 show pioneers on hand. Before getting down to business, the crowd gathered Monday night, March 5th for the traditional Welcome to T.R.A.F.F.I.C. cocktail party. This stage-setting social event has proven to be the perfect way to kick off every T.R.A.F.F.I.C. conference. The show has always been about networking and building business relationships and those goals are achieved by giving people this kind of golden opportunity to get to know each other face to face. The room was buzzing with excitement and anticipation and that electricity continued to crackle through the days ahead. Later in the evening attendees headed off to sample the entertainment options Las Vegas is famous for. Some tried their luck in the casinos while others headed off to private parties or to see a show. 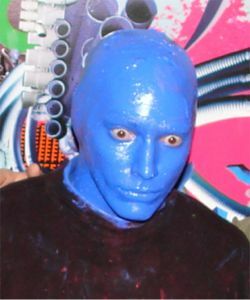 I joined a group that DomainSponsor took to see the indescribable Blue Man Group. It was a psychedelic feast for the eyes, ears and other senses that ended with the entire audience literally buried under an ocean of tissue paper. I wouldn’t want to be the guys who have to clean up the theater! On the other hand, they manage to get it done every night, so maybe we could try calling them in to help ICANN clean up the Registerfly mess! Though I expected the late night revelry around town (that produces symptoms that have come to be known as the “Las Vegas flu”) might lead to some empty seats Tuesday morning, there was a sizeable crowd when the day began with the Sturgeon Law Group sponsored breakfast. By the time Schwartz and Neu took the stage to officially open the show at 9:45am, the place was completely packed. 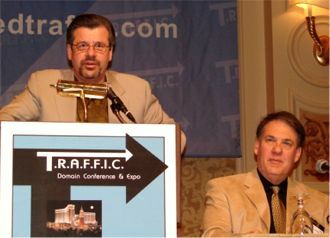 Moniker.com CEO Monte Cahn followed with instructions for participating in the multi-million dollar live and silent domain auctions that would follow Wednesday. 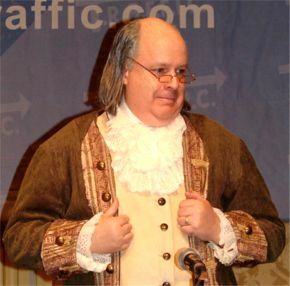 At 10:20am, the new Internet Commerce Association had its coming out party as attending board members, with Benjamin Franklin in tow, stepped onto the dais to sign a Domain Owners' Bill of Rights. Franklin appeared at the conference to personally hand this historic document (printed on rolled parchment paper) to show attendees. Domain Owners' Bill of Rights For the first time, with the ICA, domain registrants have a powerful organization that is ready to fight for their rights. 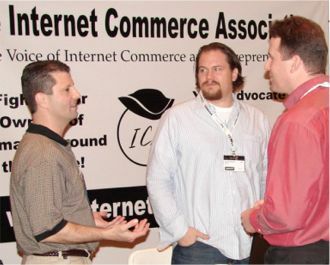 The non-profit ICA was founded in October 2006 when several leading domain companies, owners and investors donated $50,000 each to get the organization off the ground. A well-respected and highly experienced Washington D.C. attorney and lobbyist, Phil Corwin, was hired as the ICA’s Legal Counsel and former Sedo Director of Business Development, Jude Augusta, signed on as the group’s Executive Director. After spending the past five months quietly building the ICA foundation and filling these key positions, the board opened the doors to new members at T.R.A.F.F.I.C. West. In an effort to build the broadest possible base of support for domain owners, memberships begin at just $99 for the Ambassador level and $495 for the Professional level. Corporate sponsors have also begun signing on at $7,500 each. It will take a large war chest to defend our rights and assets against the well-financed forces that are lining up to take them away, but I believe that if we unite in this effort, the days of domain registrants being ignored and abused are over. The ICA’s Board of Directors is made up of representatives from Name Administration, Inc. (Frank Schilling), iREIT (Bob Martin), Oversee.net (Josh Armstrong), Sedo.com (Jeremiah Johnston), Straat Investments (Juan Calle), the World Association of Domain Name Developers (Rick Schwartz and Howard Neu) and DNJournal.com (Ron Jackson). It is expected that other leading companies in the industry will also join the board as the ICA continues to grow in the months and years ahead. However, if the organization is to have real strength and staying power, it needs everyone’s support, regardless of how many domains you own. There truly is strength in numbers and every single new member will play a key role in giving the ICA the kind of muscle it will need to fend off the ever increasing threats to the assets you have built through your vision, your hard work and your capital investment. Others would like to step in now and harvest the fruit produced from the seeds you have sown but we believe that the ICA, with your help, can keep that from happening. 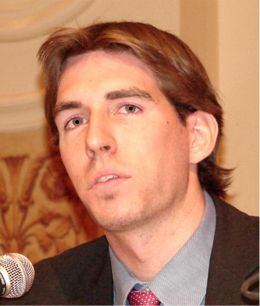 In the final morning event, the Recall Media Group hosted a session detailing success stories that resulted from connections made at previous T.R.A.F.F.I.C. conferences. Recall founder Sahar Sarid and company CEO/President Darren Cleveland headed a panel that included domain investor Gregg McNair, Faisal Chughtai (VP of RBC Capital’s Technology Group) and Ari Bayme, a VP at investment banker Milbank Roy who specializes in technology related transactions. 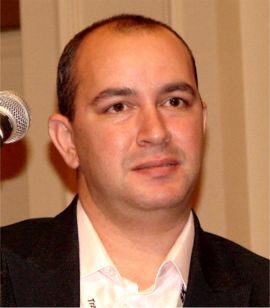 VP, RBC Capital Sarid has moved far beyond the bounds of domaining and is focused on building full-blown businesses rather than simply monetizing domains. Recall’s FuneralHomes.com is a perfect example of this. The site has risen to a dominant position in the search engines and has aggregated more advertisers than any other entity in the funeral business. Sarid met Cleveland at a previous T.R.A.F.F.I.C. conference and that pairing has turned the company into an important force in domain and business development. Chughtai, whose company helped Marchex raise the $164 million they needed to purchase Yun Ye’s Name Development portfolio, said that there is a great deal of capital on the sidelines looking for an opportunity to get into the domain business. Those investors would rather buy successful developed sites than raw domain names and that fact is fueling the current search for development partners being undertaken by owners of high quality domain names. 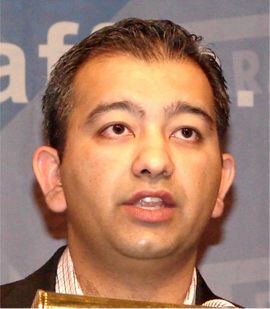 Chughtai said he believed RBC has benefited more from contacts made at T.R.A.F.F.I.C. than anyone else. Bayme added that it is quite possible for every show attendee to boost their bottom line by 10-15% through contacts and partnerships made at T.R.A.F.F.I.C. conferences. Perhaps, the primary thing that has set T.R.A.F.F.I.C. apart from its competitors is that it has succeeded in attracting the heaviest hitters from both the investment and domain ownership camps. 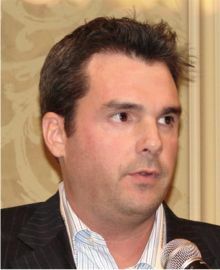 LeaseThis.com hosted a 90-minute lunch break punctuated by a short presentation from the company’s CEO, Jonathan Boswell. You can learn more about that ground-breaking new firm in an article we recently published about the company. The afternoon session then got underway with Madison Avenue Round Two, a sequel to the lively session at T.R.A.F.F.I.C. East in Florida last October that Rick Schwartz has described as the best seminar in show history. As it did a little over four months ago, this session brought in a panel of top advertising executives to explain how Madison Avenue views the domain market and why major advertisers have failed to scoop up key generic names that define their product categories. The panelists included Will Margiloff, CEO of Innovation Interactive Corp., Bill Lickson, Director of Interactive Strategy at Zimmerman Advertising, Lance Podell, CEO of Seevast and Matt Bentley, Chief Strategy Officer at Sedo. Though major advertisers have bypassed opportunities to acquire category killer domains, Margiloff said Madison Avenue is not ignoring domains, they simply don’t yet have an understanding of the channel. He said T.R.A.F.F.I.C.’s first New York show, coming up June 19-22 at the Grand Hyatt in Manhattan, could go a long way toward bridging this education gap. Lickson noted that advertisers remain focused on their brands rather than the generics that define their business. “Starbucks.com is not Coffee.com because their brand allows them to charge $5 for a cup of coffee!,” Lickson said, adding that he did think that Coffee.com would make a truly great media property that could provide news and information about the popular beverage and profit from advertising on such a site. In fact, Lickson said there is a huge potential upside for generic domain owners who think of their names as media properties and develop them for that purpose. If you hope to make a killing by selling to a major advertiser, Podell said that is probably a pipe dream. He noted that advertising campaigns have a set budget and if a domain name is to be part of the campaign it has to fit within the budget. He said advertisers will think of a name that would help them but it if costs $1 million they say “forget it!” He added that the sweet spot for ad campaigns is names in the $5,000-$10,000 range. Lickson agreed, saying that on an ROI basis, it may be more effective for advertisers to buy clicks for specific campaigns than to purchase a domain name. Unless major advertisers can be convinced otherwise, these exchanges seem to underline the wisdom of making something out of your best domains rather than counting on a huge sale to unlock their real value. GoDaddy Girl Candice Michelle Stops T.R.A.F.F.I.C.! Reese's Pieces: Keynote Speaker John Reese Tells You How to Quit Leaving Money on the Table!